At a young age, you got familiar with the concept of “taking out the trash.” This is typically the first job a kid has as a way of earning their allowance. You learned back then that it’s easy to fill up the house trashcan, said it out the curb and then let the workers come by and pick it up. It’s a process that is repeated every single week throughout the country. However, there are some items that won’t fit into that trashcan. When you come across something like an old lawnmower that you want to get rid of you have three choices: keep it, get rid of it yourself or bring in the pros. 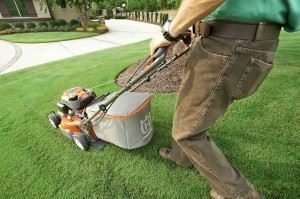 If you keep an old lawnmower, then you’re going to be taking up a lot of valuable space in your garage or backyard shed. This is the kind of thing that is always going to get in the way. You may also find yourself constantly moving it out of the way in order to get to the things you really need. This is certainly not an efficient use of space or your time. If you were to get rid of it yourself, then you have to make sure you’ve got a truck big enough to haul an old lawnmower. That might be easy to fit onto the back of the pickup but just exactly where would you be taking a lawnmower? That might mean several hour drive out of the city to the nearest landfill. Once you get there, you may find yourself waiting in line behind a lot of huge garbage trucks making their drop-offs for the week. This is certainly not a fun way to spend your Saturday afternoon. Perhaps the best approach is to bring in the pros and that would be a call to Junk King Dallas Mid Cities. This junk hauling company has been in this line of work for over 10 years. In that time they have picked up literally tons of unwanted furniture, appliances, electronics, household goods and old lawnmowers. Even though you may just be hiring Junk King to take away that old lawnmower there’s no reason why you can’t get rid of the rest of your unwanted clutter on the same trip. Take a moment to consider how your home can change once it is clear of rubbish. Don’t hold onto an old lawnmower and junk. Give it all to Junk King Dallas Mid Cities today. This entry was posted in Dallas Mid City Junk Removal and tagged junk King, junk removal, old lawnmower, rubbish on September 30, 2017 by Junk King. Last updated October 1, 2017 .